Raj Kiran Cinema's thriller, titled 'Viswamithra', is based on true-life incidents. Starring Nanditha Raj, Sathyam Rajesh, Ashutosh Rana, and others, this one is directed by Raj Kiran. To be produced by Madhavi Addanki and Rajinikanth S, its title logo was launched on Sunday at Prasad Labs on the hands of Ashutosh Rana. 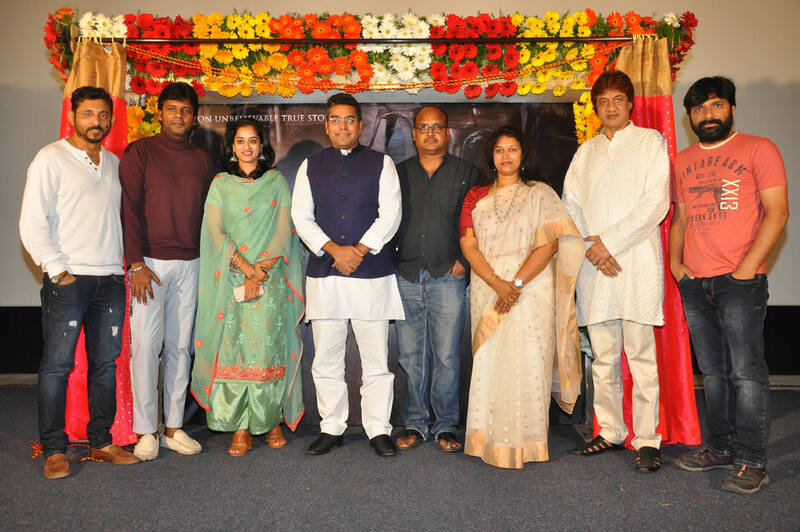 Speaking on the occasion, Ashutosh Rana said, "There is so much talent in the Telugu film industry. The technicians here are handling different departments so well. Coming to my career, women have always been lucky for me. My debut film 'Dushman' was directed and produced by women. Since Nanditha Raj is the main lead of 'Viswamithra', this too should become a big hit! I will be seen as a possessive husband in the film. Raj Kiran has etched my role so well." Sathyam Rajesh said, "Raj Kiran garu had narrated this storyline to me 1.5 years ago. I liked it. He then started developing it into a story. One day, he called me up and told me that I am the hero. I am not the film's hero as per the story. But it's an important character. More than my character, Ashutosh Rana garu, Nanditha garu and Mallik garu have bigger roles." Nanditha Raj said, "It's a very good story. I thank the producers, the director and all the technicians working on the movie." Producer Addanki Madhavi said, "I okayed the project in a single sitting. The story is that nice. This thrilling love story is based on true incidents that happened in the US and Switzerland. We have never seen such a story in Telugu." Vamsikrishna Akella said, "I thank my director-friend Raj Kiran for giving me the opportunity to write dialogues for this movie. The film has a never-seen-before climax in it. It's a family thriller." BVS Ravi said, "Sometimes, truth is stranger and more frightening than fiction. Raj Kiran, who has laid the foundation for the revival of the horror-comedy genre, is doing a great job." Director Raj Kiran said, "Horror and thriller genres are having their best time in Telugu cinema. I for long wanted to make a film based on a true-life incident. It's finally happening now. When I talked to my friend about a real incident that happened in the US, he was surprised to know that such incidents happen for real. A similar thing happened in Switzerland, too. My film talks about the incidents in these two countries. I approached several heroines with the story. Although they loved the script, they were not ready to do the film since 'Sathyam' Rajesh is the hero. But Nanditha Raj had no reservations. I thank her on this occasion. 50 per cent of the picturization is over. My friend Vamsikrishna Akella is the dialogue writer. My another friend BVS Ravi is a co-writer." Nanditha Raj, Sathyam Rajesh, Ashutosh Rana, Prasanna Kumar, Vidyullekha Raman, Chammak Chandra, Getup Srinu, Paruchuri Venkateswara Rao, Jeeva, Rocket Raghava, CVL Narasimha Rao and Indu Anand are members of the cast. Dialogues are by Vamsikrishna Akella. Cinematography is by Anil Bandari. Editing is by Upendra. Action choreography is by Dragon Prakash. Choreography is by Baba Bhaskar and Shekar Master. Art direction is by Chinna. Co-direction is by Vijay Chukka.